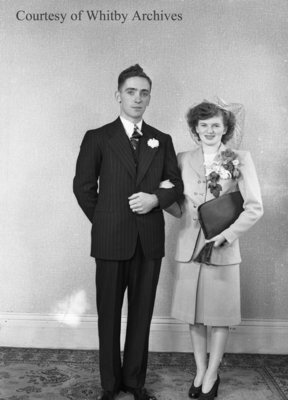 A black and white large format negative of Robert and Wilma (Charlton) Heron on their wedding day, November 8, 1947 in Brooklin, Ontario. This negative has started to degrade. Heron Wedding, November 8, 1947, Marjorie Ruddy. Whitby Archives A2013_040_522.